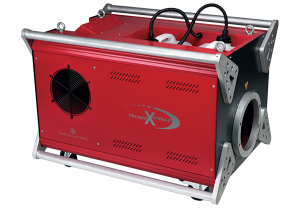 The Trainer X-Stream is the most versatile professional atmospheric effects generator available today. By incorporating the X-Stream Airflow System, the Trainer X-Stream blends smoke and air to produce a variety of effects; from an optically translucent haze to an immensely dense EURoewhite-outEUR of smoke. The Trainer X-Stream has been designed to deal with the excessive rigors of training, with a rigid chassis, protected on all eight corners by 20mm aluminium plates, and 40mm lifting bars. The outer casing and control panel also offer a degree of protection in poor weather conditions, making the Trainer X-Stream ideal for outdoor use. Overheat protection is also guaranteed through a unique, Direct Thermal Protection device. The Trainer X-Stream is fed by a massive 19-litre (5 US gallons) capacity. Basic control is also possible via the Trainer X-StreamEURTMs remote (optional), allowing the machine to be fired at preset levels.This, coupled with the analogue link facility, permits multi-machine control from a single MSS multifunctional controller. Size:(LxHxW) 1140mm x645mm x 655mm. Coverage: 5000Cubic meters per Min and rated continuous (at lower Output). Control: Remote connection using 3 pin XLR. Accessories: Trainer X-Stream remote.& Ducting System.